The nucleolus will disappear, the nuclear envelope will break down and the chromatin will condense into visible chromosomes as the spindle apparatus begins to form. Homologous chromosomes will pair up in a process called synapsis. Crossing-over can occur that involves breaks in each of the paired chromosomes which then can rejoin with the opposite homologous chromosome. 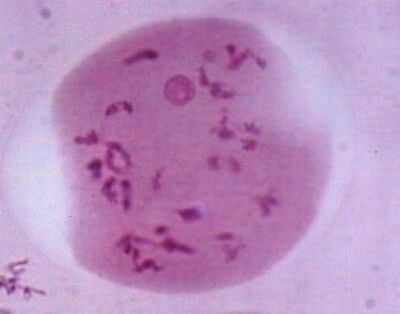 This is the first substage of prophase I, the chromosomes appear within the nuclear envelope however they are not yet fully condensed. Each chromosome is a thin thread of DNA along which clearly defined beads of local coiling (chromomeres) can be seen. 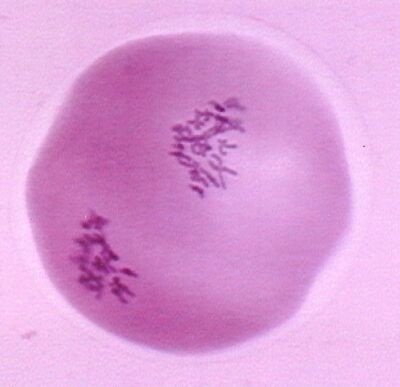 The chromosomes, while they have this threadlike form, are called chromatonemata (sing. chromonema). The chromosomes appear single because the sister chromatids are still so tightly bound to each other that they cannot be separately seen. During this stage both telomeres of each chromosome are turned toward, and probably attached to, the same region of the nuclear envelope. Leptotene is also known as leptonema; and as the bouquet stage because all the telomeres tend to contact the nuclear envelope in one spot so that the looped chromosomes balloon out from that point like flower petals. The homologous chromosomes begin to unite (synapse) by coming into approximate alignment. 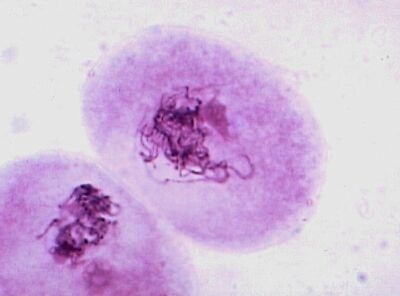 The fused homologs look like single chromosome under the light microscope, but that are actually double. The interface where two homologs unite is called a synaptonemal complex, which can be seen under an electron microcope. Zygotene is also known as zygonema. Once the homolog pairs synapse they are called tetrads (each has four chromatids) or bivalents. The two sister chromatids of each chromosome separate from each other. This makes the chromosomes look thicker. Homologs are still paired at this point. Pachytene is also known as pachynema. Non-sister chromatids remain in contact throughout pachytene and a kind of localized breakage of the DNA occurs, which is followed by exchanges of DNA between them. This process is called crossing over. At the beginning of this stage each chromatid of each chromosome is still fused to a chromatid of that chromosome's homolog, they now begin to separate from each other. As they are still connected by two strands of DNA at each of the points where exchanges took place, they cannot separate completely . At each such cross-over site, the two strands form an x-shaped structure called a chiasma (pl. chiasmata). The chiasmata then begin moving toward the ends of the chromatids. This process of sliding toward the ends is known as terminalization. Diplotene is also known as diplonema. This is the last stage of Prophase I, the nucleolus disappears and terminalization reaches completion. The chromosomes coil tightly, and so become shorter and thicker. The nuclear envelope begins to disappear. The centrosomes reach the poles. Crossing-over is completed after prophase I. The spindle fibers attach to the centromeres of each chromosome. Both kinetochores of each sister chromatid pair are turned toward the same pole. As a result, both kinetochores attach to spindle fibers from the same pole. (This is a major difference between the metaphase of mitosis and meosis I) This leads to the separation of the chromosome pair during the next phase. Here, the chromatids remain together as one complete, replicated chromosome. The separation of the homologous chromosome to reach the opposite poles is called disjunction. A haploid set of chromosomes that has two sister chromatids now is at both the poles. The chromosomes uncoil, and form chromatin net. the nuclear membrane reappears. A cleavage furrow appears and by the end of this stage and the parent cell divides into two daughter cells. 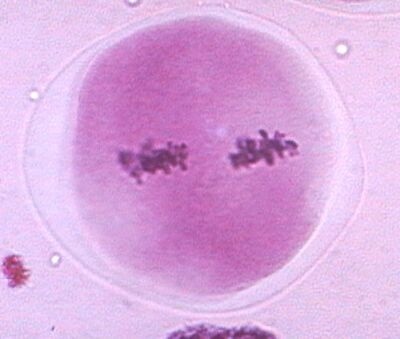 This separation of the cytoplasm is called cytokinesis. 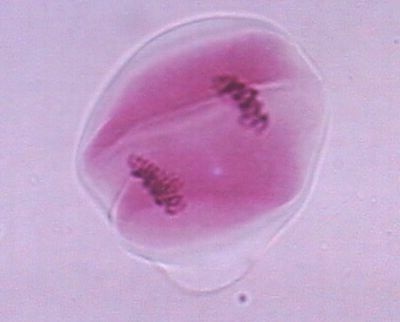 In some organisms nuclear envelopes appear briefly at this point , but in others the daughter cells begin immediately to prepare for the second meiotic division. Prophase II begins with the two daughter cells produced by the first meiotic division, the chromosomes are condensed. 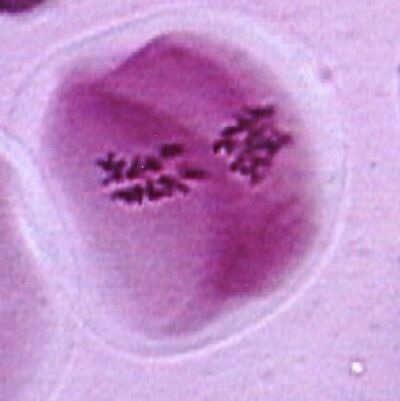 The nuclear envelopes begin to break down, the centrosomes have replicated and are moving toward the poles. Each chromosome consists of two distinct chromatids attached to a single centromere. In metaphase II , the spindle is completed and draws the chromosomes to the metaphase plate. Here, unlike metaphase I, the two kinetochores of each centromere bind to spindle fibers from opposite poles (as in mitotic metaphase). During this stage sister chromatids of each chromosome separate and move towards opposite poles. Once they are separated, the chromatids are now called unreplicated chromosomes. 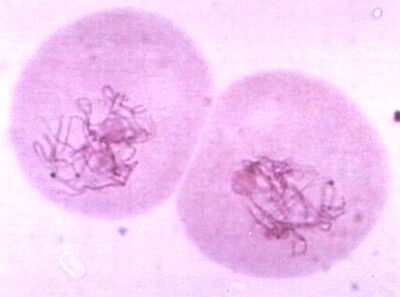 These chromosomes are dragged along by the spindle apparatus, their arms can be seen dragging along behind so that the chromosomes form V-shapes. The poles themselves move further apart as the cell lengthens. During telophase II, the chromosomes reach opposite poles, and uncoil. The nuclear envelopes form. This is then followed by cytoplasmic division. Meiosis is now complete. Once the cells are separate, they are individual haploid cells. In some cases they need to complete their differentiation into the gametes. 1. It maintains the same chromosome n umber in the sexually reproducing organisms. 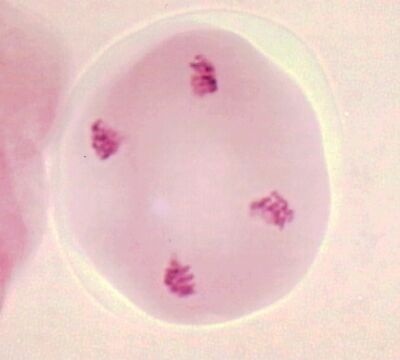 From a diploid cell, haploid gametes are produced which in turn fuse to form a diploid cell. 2. It restricts the multiplication of chromosome number and maintains the stability of the species. 3. Maternal and paternal genes get exchanged during crossing over. It results in variations among the offspring. 4. All the four chromatids of a homologous pair of chromosomes segregate and go over separately to four different daughter cells. This leads to variation in the daughter cells genetically. 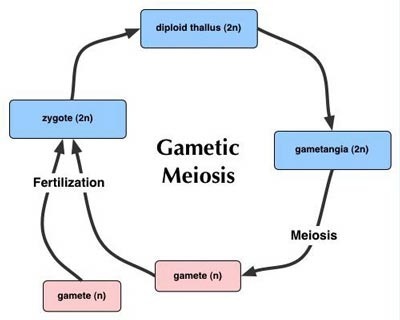 Meiosis occurs in the gametangia. Gametes are the only haploid cells. Characteristic of most animals. This is the familiar life cycle type, common in animals. 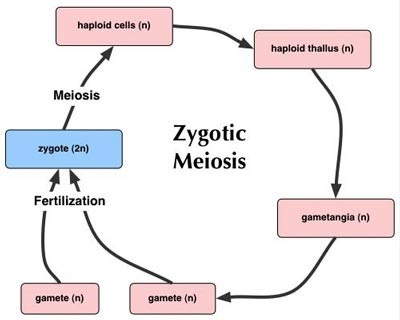 Meiosis occurs in the zygote. Zygotes is the only diploid cell. If the two generations are morphologically similar, the organism is said to have isomorphic alternation of generations. This type is characteristic of some algae and a few fungi.